We are a small practice. However, we seek to engage with horizons that take us beyond our immediate context by entering design competitions where these provide an opportunity to better our understanding in areas we value. Below is a small collection of competition entries that we have been involved in over the past decade. A two stage competition that asked members of GenY to consider a housing prototype adapted (or adaptable) to the needs of the generation. A key criterion was affordability - getting GenY into home ownership. Another was flexibility to suit changing user demographics and the ability for the dwelling to grow with the owners’ changing circumstances. Our entry failed to be shortlisted, however, we believe a valid model can be found in the adaptation of the generic project home with standardised plug-in modules that address fundamental design deficiencies. 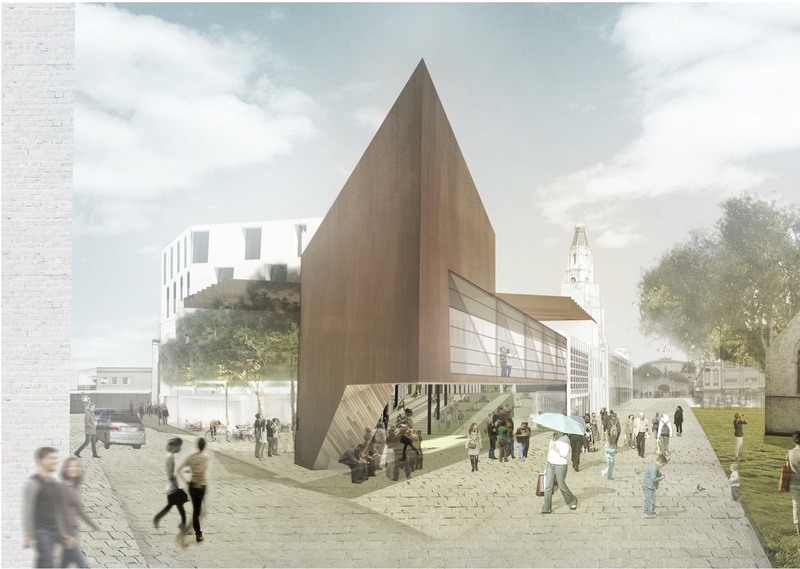 A competition hosted by the City of Fremantle to design a replacement for existing civic and community facilities in the heart of Fremantle. A collaboration with David Barr & Ross Brewin (fellow architects) that explored the scalability of the notion of 'Alterations + Additions'. Our entry proposed to keep significant portions of the existing council buildings, stripping them back to their modernist essentials, then repopulating according to the methodolgies: subtract, add, multiply. Our scheme was 1 of a shortlist of 6. Three of those entries were ultimately chosen to proceed to stage 2. 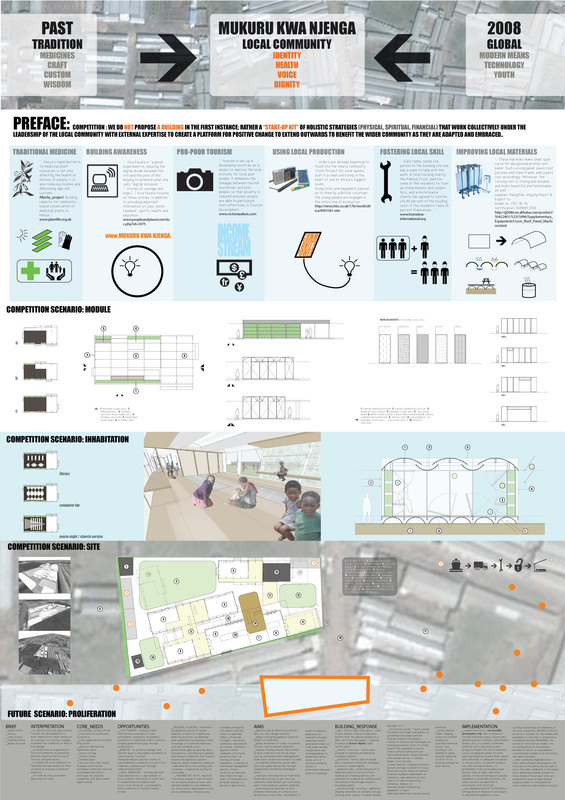 A competition hosted by Architecture for Humanity (AFH) to design a technology centre in a slum in Nairobi, Kenya. An entry in collaboration with Chris Pratt. Our scheme proposed a holistic intervention that sought to build on existing elements within the slum community - locally prevalent materials or knowledge - with the aim of strengthening what was already there. 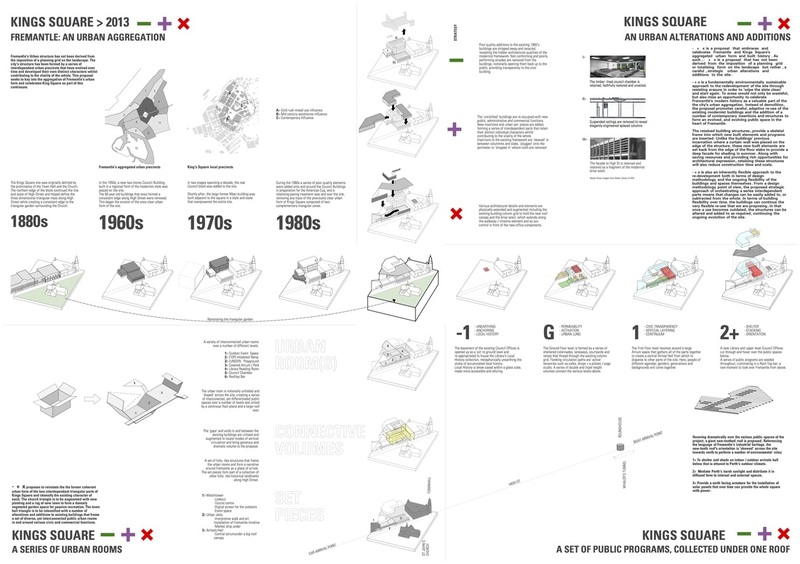 We did not want the architecture to be imposed; we wanted to provide a few catalysts that would allow an architecture to be established as a manifestation of new or renewed community dynamics or program. 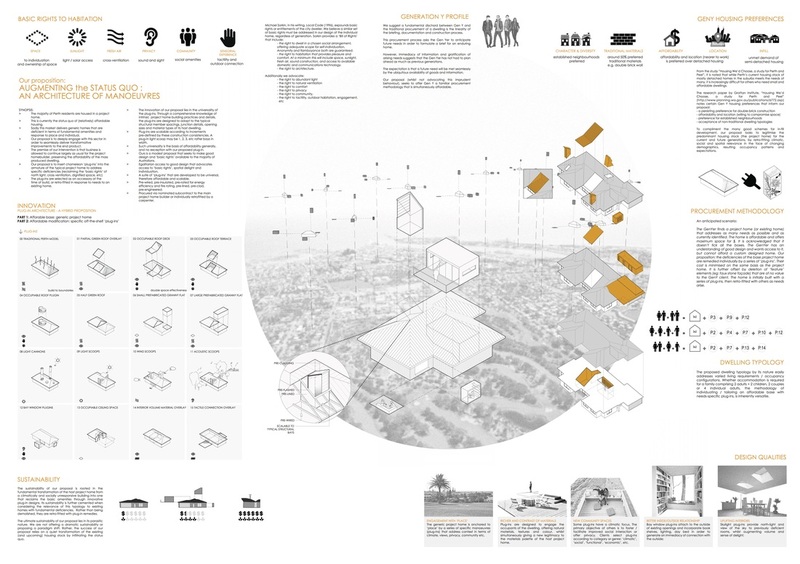 At the core of our proposal was our grappling with the concept of 'human dignity' and the potential of architecture to promote it. Our entry was short-listed as 1 of 20 internationally. A competition organised by the Thai Government in response to the devastating events of 26.12.04. A competition organised by the Catholic Education Office for a site south of Mandurah, a sand dune between sea and estuary. A proposal in collaboration with Chris Pratt, a fellow architect and friend. 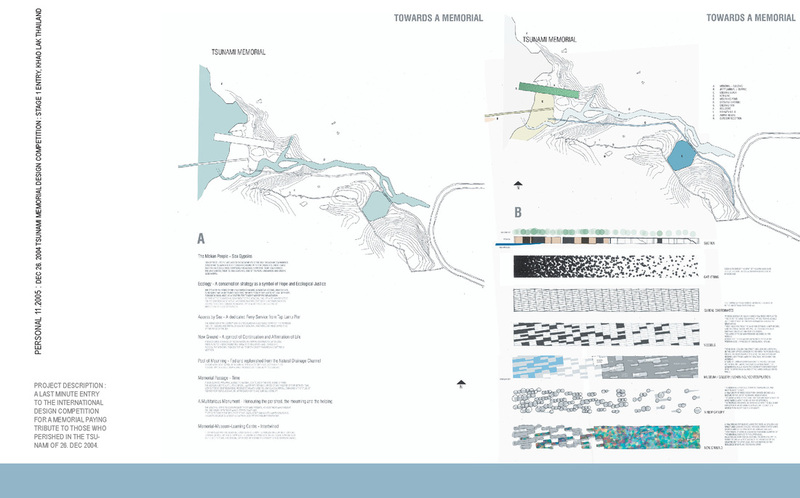 Our proposal was a simple response to the contours of the site. 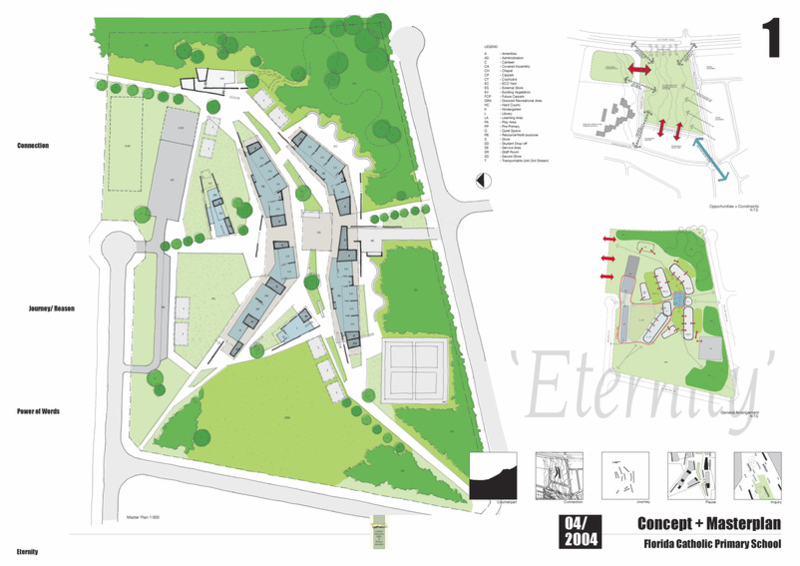 The buildings were conceived as terraces with northern orientation, the roofs silver slivers anchored by masonry elements, with flexible classrooms between them.